Steve Elkington visits Savannah, GA and learns more about teamsters, Rat Pack, Jimmy Hoffa, beers, and ghosts. We also highlight "Fishin' For Jamie," a local charity set up to fight skin cancer. [MUSIC PLAYING] NARRATOR: On this episode of "Secret Golf." NARRATOR: Stroll among the mossy oaks as Steve Elkington explores a unique southern escape. -Savannah is a very mysterious, wonderful place. NARRATOR: On a course steeped in Hollywood history. -To me, Dean Martin, Sammy Davis, Jr., Frank Sinatra. I just could not imagine being here when they were here. NARRATOR: Elk teams up with the locals and gets the secret scoop on the mystery. THEME SONG: It's "Secret Golf." It's what I'm looking for. It's why I get up every morning, call my good-timing friends, keeps me coming back for more. "Secret Golf." We're headed down the road. We just loaded up the big show, he's gone looking for the heart and soul. Rolling till the wheels fall off, it's "Secret Golf." -Savannah is a very mysterious, wonderful place. It has all the fingerprints of a leftover from a time before. It has the incredible architecture. It has the wonderful size trees that have been there for hundreds of years. NARRATOR: Interwoven amongst the Spanish moss that decorates this majestic landscape permeates nostalgic tales of old and new in one of the most enchanting cities in the United States. -The reason people come to Savannah is because of all the great things that happened to this town over the years, and I think over the years, it's built up this fantastic spirit. Start out with James Edward Oglethrope, who was a British nobleman. He sacrificed so much just to come here so he could found a town for the relief of insolvent debtors. And through the years, good things have happened to Savannah. NARRATOR: From century-old buildings that have withstood trying times to the historic district defined by the squares, this enticing city will instantly charm. -The visual and physical beauty of it. I mean, we're the largest national historic district in the country, and you can pretty much walk wherever you want to go. If you're staying downtown and visiting, take a nice stroll and see beautiful houses, and eat in great restaurant. And it's a great place to visit. It's a great place to live. -There's a reason that people come here. There's a very nostalgic feel about Savannah, whether it's the sheer antiquity of that town with the trees and the architecture combined. Personally, Savannah's a place I could live, and I don't say that very often. Oh, and it's got ghosts. NARRATOR: By rights, Savannah is a place that lends itself to stories. If you're looking for golf stories in the area, look no further than the Wilmington Island Club. To say that its history extends beyond the revered golf course takes nothing away from the 1927 Donald Ross design. It's just that the club's colorful past in a black and white era is that remarkable. -One of the reasons that we wanted to come here was the Rat Pack came here. Frank Sinatra, Dean Martin, Sammy Davis, Jr., all these like supte movie star type people were coming here, and playing golf, and partying. -And we had people all over, from all over, just come down here to the play golf. -And there was a connection with the Teamsters out of Chicago. They were real rich, you know, in charge of the union. That mater-- that mysterious M word, you know, from "Chi-cah-go," you know? -I only know what I've heard, and the hotel originally-- not originally, but when I first moved here-- was owned by the Teamsters. And there were all sorts of interesting stories about trying to book a room. Sorry, we're booked. And you'd go in there, and there was nobody in the hotel. But those were just rumors. -All the Cadillacs and all those great cars. All the great, old style gear, the big apple hats. All that was right here in Savannah, and I love that era. NARRATOR: When you have that many big time players involved, there are bound to be a few, well, gray areas, including one possible urban legend about a man called Hoffa. -There's a helicopter pad out by the water that was poured the night of or the night after he disappeared in the middle of the night. -Tell us about what we're standing on right here. -This is, uh, the helicopter pad right here, where we're standing there, and we have them come in different places. They fly us in. -Yeah. They fly us out. Stay about maybe two days or three days. They trying to say, well, they had a hit on him in Savannah, and something happened to him. -When they tore down Giants Stadium, they expected to find him. When they built a new Yankee Stadium, they expected to find him. But nobody's ever come here, so it's a mystery that we might all go to the grave with. -We ain't going to go into that? -We don't want to get into that, but, um, that's the word. Let's-- let's move away from this area. 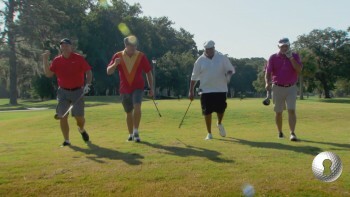 NARRATOR: In this episode, "Secret Golf" pays homage to the Brat Pack with our own fantastic foursome. Or something like that. -This is our Rat Pack today. -Yeah, we're a Rat Pack, all right. -It's a pack, all right. -Bubba, you-- you go way back here. -Oh yeah, oh yeah. I go back in 1956. -I've never worked here. I just play here. -I played once here, yeah. -We're going to have some good stories, but first, we're going to warm up because we're going to have a little-- we're going to have a little three-hole match. We haven't decided what-- who's going to play on what teams yet. I'm going to evaluate the talent. -To see which-- which person's going to go with me so I can't lose on my own show. So why don't we warm up a little? NARRATOR: Watching this crew warm up provides Elk with more questions than answers. -I went 60s today for the Rat Pack. -Oh, man. Hey, I like that, old Dean. Looking good. - -- all the rest if it's just for-- people just use it for recreating? -Steven Hamilton, he's local. He's-- he's our friend. He's a friend of mine. Came to Texas and saw before. We worked on his swing a little bit, and I reminded him of what he was supposed to be working on towards the end of the session where we wanted to get that club a little bit more. He has a tendency to go up onto that way. We want those thumbs to almost be vertical. -Yeah. Keeps that club face-- look, see where that club face is up there? So your tendency, you know, you guide it back a little bit. -Yeah, we just want to be there, and we just want to be there. There's not much can go wrong with a club. We've talked about this. If I stuck that into a machine, and all the machine did was take it from that 12 o'clock position to that one, and all the machine did all day was just go bang, there's not much can go wrong with that. -Right. So I get the grip, bring the club back. So I started doing that, and I've been practicing that quite a bit. So, uh, but it worked. STEVE ELKINGTON: So we're going to play a scramble, and we may change rules as we go. We don't know yet. Bubba, Mark, my friend Steven Hamilton, who's a local. We've decided that we're going to take on you two guys today. BUBBA DAYS: On hole 14, we're looking at a par 5. Anything to the right, if you hit the ball over 300 yards, you might get in a little trouble. -I think I'm a-- I'm a 295 guy. -I think you might be OK.
-So they can get up, and I think they had a secret golf meeting on the way to the first hole. Because all of a sudden, you know, Steve just comes out of his shell and blows one down the golf course. They threw a pack of cigarettes at my swing, and it didn't-- I think it cut through three of them, but it didn't even didn't bother the shot. It went straight as an arrow. -My big thing on the second set was just get it over the water. We can hit a wedge in, get it on the green. We can, you know, leave ourself a spot for a birdie. That's all I wanted to do, especially after he hit a second shot, flared it to right into the bunker. -Hamilton came out of the bunker really good for him, because he-- he's just horrified of bunkers. -He gives one shot all day. -Thank you very much. Thank you very much. And I was pretty surprised, and that's when they started calling me sandbagging. So that's when they started. -Got to hit it, Alice. -Oh, he's going more Kardashian. -Hit it! Got to hit it. You just kind of pull it. -We won that hole with Hamilton making a putt. He never makes putts. He's a terrible putter, but he made that putt. -I was shocked as everybody else that it went in, so I was very excited. NARRATOR: That week at Wilmington Island was about something greater than golf. The community and Elk came together to support Fishing For Jamie, a local charity set up to help in the fight against skin cancer. -So it all began when my husband was diagnosed with melanoma, and he was in advanced stages. I saw a mole on his back that was about the size of a pencil eraser. And it was dark, and it was changing, and I was really concerned about it. I asked him to go to the dermatologist, and that's when we found that it was melanoma and that it had already grown to such great depth's that it was, uh, it was in a bad-- he was in a bad stage. NARRATOR: Jamie Fulcher hailed from Savannah and sadly lost his four-year battle with skin cancer in November, 2007. Since then, the people of Savannah have rallied around to not only make a significant difference but to honor Jamie's memory. STEPHANIE FRANKLIN (VOICEOVER): It makes me feel proud to be part of this community and happy that it's bringing awareness. It's not just, you know, raising the money, but it's bringing awareness that maybe it could save somebody's life because it's critical that-- that we teach preventive care and catch it early. I mean, that's the key. -Oh, I've had 100 and something moles taken off of me, but I've had three melanomas, three serious-- three serious experiences with melanoma. NARRATOR: Dr.Howard A. Zaren is a surgical oncologist from the Lewis Cancer And Research Pavilion. -It happened to me. My ear was bleeding all the time. -My theory is I'm not going to let-- I'm not going to die from melanoma. That's my-- that's my mantra. I'm going to get them checked and get them cut out as needed. NARRATOR: Golfers are prime targets for sun exposure. NARRATOR: But there's simple steps you can take to be sun safe. -These are things you teach your children early on so that it just becomes natural. Things that our society have said, oh, you-- you have to look tan to be pretty or to look great. Go get a spray can. -OK, guys, second hole of the Secret Smackdown just happens to be number 15 at the Wilmington Island course, right? What are we looking at here? Beautiful looking par 3. Over the water. BUBBA DAYS: Over the water. STEVE ELKINGTON: Anything-- anything special about it? STEVEN HAMILTON: Just watch the breeze. Don't be short of the hole or it'll spin back into the water. -Yeah, looks like the green slopes down. -OK, Hammy, you're on fire. STEVE ELKINGTON: Watch out! The hole! Oh! STEVE ELKINGTON: No, it's rough out of the hole. STEVE ELKINGTON: Short-- short of miraculous. -[INAUDIBLE] you know what? I can't stay down. I don't know what's wrong with this thing here. This head! This head is too heavy. I had plenty trouble there. I mean, more trouble than I could ever-- can barely stand at that time. And that's when the funky chicken just kine of make me kind of relax, because I had to kind of shake it off some kind of way. So that's when I winded up doing the funky chicken. -Bubba was a good sport. He-- I think he did a dance after he hit it in the water. Does he have the best sort of, uh, bad shot celebration in the history of golf? I think he does. STEVE ELKINGTON: A little trouble there for Bubba and-- and Mark. -We wound up in the bunker on the left, a little-- a little short par 3. I said, OK, these guys are going to start talking trash, so I better do something. -Get in there! Get in there! Was that the early walk? Yeah, he did early walk. He was putting, and he thought he made it. And he went for the-- oh! It missed around the edge. That's called the early walk. -That's OK. Come on, let's go. NARRATOR: Welcome aboard, Elks. Have a look tour of Savannah. Experience the colorful characters that play host to the most interesting city in the South. -We decided to come to Savannah basically to start Moon River. We felt like there wasn't a whole lot happening in the southeast as far as craft beer. There was only room to grow, and that's really been the case. -Once you get me near a pub, because I'm Australian, I really sort of fit into my heritage really well. That's IPA. Way too sweet for me. -Good palate, by the way. -Swamp Fox? I used to have girlfriend named that. I kind of position my little ideas on the ones I like. -But hey, I'm a beer lover. What can I say? Shut up and drink your beer at Moon River. NARRATOR: As the Elk-pedition rolls down the sightseeing streets of this bustling southern coastal city, Elk sets his sights on a new type of grip. -So this is how we're going to do it. We're going to take one of these, and there we go. Put it on there, let it dry. That's it. STEVE ELKINGTON (VOICEOVER): Well, I'm not a candy guy, but those guys look like the business is roaring pretty good down there. Um, I was a little out of my element there being in the kitchen, but I had a good mentor, Desmond. He taught me the ropes on how to make that caramel praline or proline or pre-- how do you-- pre-- whatever. 100 years they've been doing this. I mean, how good are you going to be? Oh wait, I didn't do-- I didn't like you told me to. DESMOND: That's all right. It's all right. -I got to tip it up on the side. DESMOND: You're going to get that. You always have the grip with the fingers squished right there, no matter what you're doing. Brush your teeth, same way. Money out of the pocket, everything. Never-- never comes apart. -I had fun down there. That's a little out of my comfort zone, but that's OK. I just made it myself. -First time. He's a pro. -How about you? You want a little bit, too? I'll see what I thought of myself. -We got chocolate ones coming up in a minute. STEVE ELKINGTON: What do you guys want to do about this deal? You want to press? BUBBA DAYS: Yeah, we pressing. STEVE ELKINGTON: We'll give you half a stroke. -In number 18, and this used to play pretty long. We had two traps in them. One up here, and one own there. STEVE ELKINGTON: Split those two? -And the clubhouse used to be across the street over thereon the water? -No, no. The clubhouse used to be on the left side of that trap out there by the green. -That's that new deal right here. BUBBA DAYS: Yeah, that's the new deal. -Wow, what's going on with Hammy? I'm going to give us the full Rat Pack effect right here. -What do you mean, stay there? That's perfect. -Man! I wish I was 20 years younger. -That's how we play. That's how we close right there. -I wish I was 20 years younger. -We can't lose TO this sandbagger and, you know, some kind of a deer thing, so we said we're going to press. We're going to go double or nothing. The worst we could do is, you know, make it a tie. -And I hit mine down the middle, but it wasn't quite as far Elkington's. But, you know. The professional deer. -Oh, God, Bubba. You just pushed it a little bit. -Look at Hammy. Hammy's on fire. I mean, he burned up the sky. -Going over. Over the green. -Almost a great putt. All of a sudden it just fell short. -If I'd of done the funky chicken when it start going up that hill, coming down, may I might have had a little more action on the ball, and it might fell in the hole. But I couldn't get my shoulders together. -So they're in for 4. With a stroke, that's a 3. We had to chip in to time on that hole. -Elk comes in, and he chips it up. And you're just hoping you don't have to listen the this crap. -Elk had to sink his, and he put a little bit too much mustard on it and went past the hole. So we tied, and it's all good. -So we're down here in the bowels of the Moon River tavern. Very creepy down here. Any ghosts in here? -You know, I'm the science guy, so I don't have a whole lot of ghost stories. -Well, you know? Funny you say that. I-- I was here for the Legends tournament three years ago, and this man right here, Lance, he took me on a ghost tour. So, 1820, um, there was a big fire. -It's a terrible year for Savannah. 424 homes were lost, and they fought that fire for days. When the people came back to this side of town exhausted, wrung out, what did they find? To their horror, they found one of their little girls strangled. -There was a boy that was left in town. His name was Renee Rondolier. He was 14 years old. Big, strong kid. He kine of had one of those tempers that snapped. -They pulled him out of his home, from his mother and father, from their arms, and they hung him in one of those trees here. The mob was not done yet. It was mob rage, and they actually took his body when they were through. They threw it into the marsh. And so to this day, nobody knows exactly what happened to the body of Renee Rondolier. -100 years later, approximately, Jim Williams, he bought this really nice home. -He had trouble with the codes, the city codes, and so he decided to move the house about three city blocks away over to St. Julian Street. When Jim Williams finally got his house moved over here, he got another call again, and this time it was from the general. He says, we've had something else happen here. We found a crypt. And he asked him, he said, well, what's in it? And they said, well, we don't know. It's covered with water. He said, just covered it up. I'll see to it when I get back. Nobody ever heard anything from Jim Williams about that after that, but the thing is was that he thought that maybe Renee Rondlier's body might have been there because that was the exact location where this alley was that this terrible event had happened. -Blah! Blah blah blah blah blah! -That's the Renee Rondlier story. -That's a believable ghost story in my mind. -It's hard to believe that when you come to some of the places we go on "Secret Golf," and these journeys we take, and we meet these people. And we went back and saw where Bubba worked years ago, and we saw some of the skeletons that were left. But the stories never change. They're there. They're imprinted into his-- into his DNA. -Life when you were young, a young fellow here working in the golf, and all those guys came through here. That must have been an amazing time. -If your track is taking you down through Savannah, I think you should peel off in here and come to the Wilmington Island Club for a little look around and game of golf. -Hey, what a chip! What a chip! You know what? It's been a wonderful trip, and we had fun downtown. -Oh, that's what I'm talking about. That's what I'm talking about. -If your travels ever bring you toward Savannah, please pull in to Savannah and enjoy yourself. I promise you, you will. NARRATOR: On another episode of "Secret Golf." NARRATOR: An outdoors enthusiasts' dream. Steve Elkington heads to a small town with a big adventure. -I very much enjoyed the prairies that I had heard so much about and just the sheer size of this part of the country. NARRATOR: Where he meets up with a couple of characters that leave one unforgettable experience. -Oh, we're going! We're going! I knew it! -We're going right out the gate. NARRATOR: On three neat golf courses, that's pure as golf gets. -You can stay on this property, um, for two or three days and don't feel like you play the same golf course ever. NARRATOR: Join Elk as he explores the wild wide open spaces with "Secret Golf's" new correspondent. -Look, Diane, as the new member of the "Secret Golf" team, you can't just roll up in the middle of Nebraska, coming from Scotland, and just wear anything. -You told me to be more American. NARRATOR: While enjoying the Heart City scenery like a local. All that and more on another episode of "Secret Golf" with Steven Elkington. "Secret Golf" with Steve Elkington has been a presentation of Secret Golf, Incorporated.